Hey everyone. 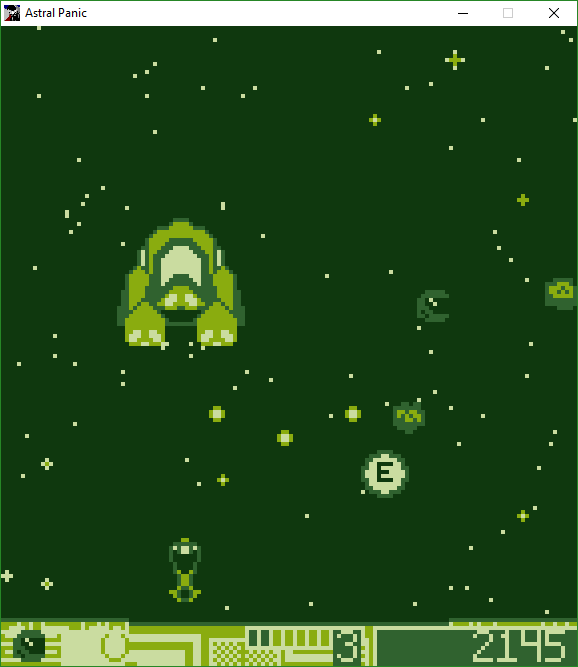 I've recently released my *first* game, Astral Panic. It's inspired by Game Boy and GB-era games (so it's quite simple, a little rough around the edges, but hopefully fun to play). I'm trying to get it onto other platforms, though I'm not sure where to go next. An Android port is also in the works. Please, let me know what you think. I played the web version a tiny bit but the heavy invertia and the wall-bouncing make it pretty difficult to enjoy. I don't know if those control quirks were already in there in the game engine you used (if you relied on one) but if you implemented it all by yourself it feels like a lot of effort to make the game feel not as tight as a good shmup. Maybe you planned this game to be played on a smartphone's touch screen from the beginning and that would why the movement doesn't translate well to keyboard input? Anyway, good job on releasing your first game. I kinda planned it from the start for mobiles but I wanted it to be playable on all platforms. If you feel like it, give it another go using a joystick. It should work on Chrome and Firefox, but I'm sure Edge doesn't support it. To be blunt, this focus on physics and "realism" guarantees I'll never touch the game again, and I am sure it is an instant turn off for many of the shmup enthusiasts here. It makes movements more difficult for the wrong reasons and because of how complicated even basic movements become due to it, even basic patterns that shouldn't be too tricky become highly lethal threats. This will also limit you as a designer. You won't be able to make intricate and tight patterns that require accurate movements and finesse because the players will slide all the way through the screen for every movement so you'll have to dumb down the attacks if you want them to stand a chance. Some gimmicks such as the gravity well can still work from time to time, if it's one specific boss attack for example. Otherwise, very precise and tight controls are very important in a shmup and you shouldn't mess with that as it's one of the things that make the genre so fun. Yeah, I knew from the beginning that adding this sort of movement would've been a big turn-off for most people. However, being a GB-inspired game, I never really planned to have super complex bullet patterns that may require pixel perfect movement in the first place. So the game was sort-of designed around this. Actually, I was inspired by JALECO's Exerion, in that I wanted to try my hand at this "realistic" handling, but without the nausea-inducing backgrounds. At one point I considered adding other ships with different handling, including one that behaves just like a regular spaceship, but it just made the game way too easy, even with a huge hitbox. Having to plan your movement a little bit ahead apparently keeps players on their toes (or at least that's what the music guy told me; I just found it super fun to assimilate the ship's movement and drift around bullets and enemy ships).